Roger Gibson and Vince Danks’ homage to classic police detective TV shows comes to life in a perfectly executed murder mystery set in the heart of London. When the discovery of a disemboweled corpse on the steps of a Hawksmoor church points to ritualistic murder, the ensuing police investigation brings cynical DCI Harker and his assistant DS Critchley to the UK’s capital to clean up the bloody mess. The trail leads to the British Museum and a shadowy group of occultists whose shocking agenda marks the beginning of one of Harker’s more disturbing cases. . . I have just had the surreal experience of reading this great graphic novel at breakfast this morning and then spending this afternoon in the same area of Bloomsbury in which it is set. 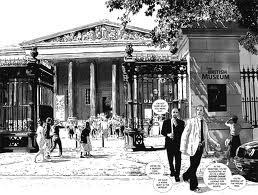 Between them, Gibson and Danks, have managed to capture the look and feel of the British Museum and the surrounding streets perfectly – I only wish I was able to also seek out the dark underbelly of the same area in which they portray the occultists and their labyrinthine lair below. 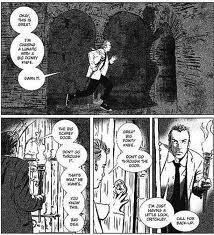 It’s not overcomplicated in its panel layout or overly complex in its art, going for a neat illustrative black and white sketch look rather than the painterly style adopted by many graphic novels in recent years, but it works perfectly well for this Sherlock meets Dennis Wheatley style tale. The characters are interesting and humorous and play on the long tradition of the junior member of the team (DS Critchley) being the one that does most of the work and has most of the answers, whilst the main investigator (DCI Harker) is seemingly bumbling his way forward and acting on blind luck rather than deep investigative procedure. If you like detective stories, noir, or modern Sherlock-like tales, this is for you. 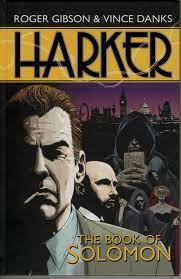 It will also appeal to those with a passion for similar crime meets supernatural comic titles such as Hellblazer. 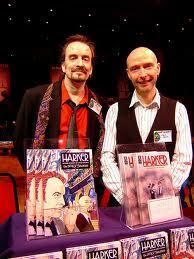 Well worth investigating…..and you can get your copy right here.